There's no slowing down for this Real Madrid team, who visited the Andalusia region this Friday night in order to take on Almeria. Being rated as the clear favorites ahead of this game, it was without much surprise that the Merengues came out of the Juegos Mediterraneos stadium with a tasty 1-4 victory, which ultimately allowed them to stretch their current winning streak to 20 games. The 3 points were earned thanks to a superb opening goal from Isco, followed by a header from Gareth Bale just before the break and finally a brace by Cristiano Ronaldo, when we had already entered the last 10 minutes of the game. 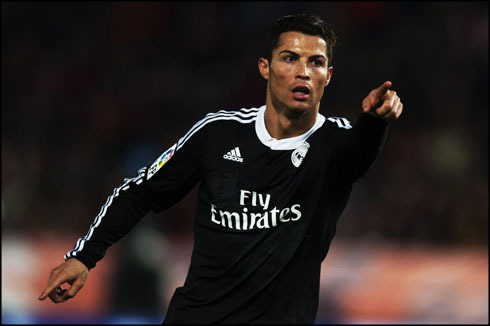 The Portuguese star has now scored 25 goals in his first 14 appearances in La Liga, but his sights are already set for Morocco and next week's challenges at the FIFA Club World Cup, where Real Madrid is hoping to get their hands on the last trophy of the 2014 calendar year. In their last La Liga match of the calendar year, Real Madrid were able to weather the storm from a tricky Almeria side, who made things very difficult for the Merengues. Real Madrid have now won 20 games in a row and head to the FIFA Club World Cup high on confidence, after a clinical second half performance gave them a 1-4 victory away from home. Despite what was at times a frustrating game, Cristiano Ronaldo again found himself on the score sheet, netting the final two goals to take his tally to 25 in the league with only 14 games played. With Isco back from suspension, Ancelotti finally had a natural replacement for the injured James Rodriguez, and the young Spaniard, who has been on a tear this campaign regardless of what position he's played in, was fantastic netting the opening goal of the match. Prior to Isco's strike, it had been a tough game for Madrid, as Almeria started brightly. Spurred on by the homecrowd, they challenged Real Madrid often making things very uncomfortable for Iker Casillas' men. But for all their hard work they were unable to score early on. Isco's brilliant strike from the left side of the box, after juking out a defender, made it 1-0 to the visitors around the 34th minute. Isco, who's been criticized in the past for his lack of decisiveness in the box, showed no such issues here, as he brilliantly curled his right footed strike into the corner of the net. 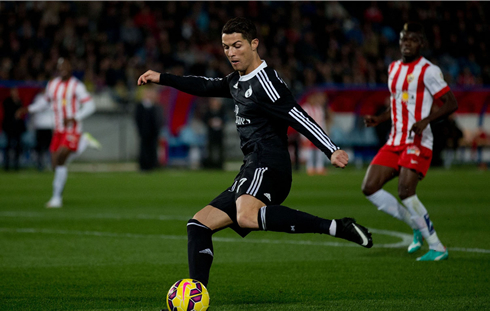 However, Real Madrid's lead would only last all of four minutes, as a brilliant strike would draw the home side level. Verza's brilliant volley from a weak clearance from Raphael Varane flew past an outstretched Iker Casillas and went straight into the back of the net. The shot, which was from well outside the box, was well worthy of a goal, as Almeria were rewarded for their impressive start. But we would have our third goal in eight minutes, as the visitors regained the lead through a Gareth Bale header, his second header in as many games. A brilliant cross from Toni Kroos on the right wing met the head of the Welshman, who then placed it right into the low corner of the goal. A tricky half was over and Real Madrid survived well, setting up for what would be another action packed second half. In the 61st minute, it almost all came to a boil, when Marcelo was called for a foul well inside the box. The Brazilian, who was perhaps lucky to not receive a second yellow, was penalized for tripping up the pacy Edgar. Verza stepped up for Almeria and placed a powerful shot to the left of Iker Casillas, who rose to the occasion to produce an excellent save, as his dive denied what would have been the equalizing goal. Real Madrid would seal the game in the 80th after some nice and quick passing between Bale, Ronaldo and Benzema (the BBC), with the Frenchman's unselfishness on display again, leaving an easy finish for Ronaldo's 24th of the year. And he'd cap it off in the 89th, after a brilliant run from Dani Carvajal on the right, who basically went through two helpless Almeria defenders, before laying it off to Cristiano behind him, for the Portuguese star to put the ball into the corner of the net with a low but hard finish. Cristiano Ronaldo next game will be in Morocco for the FIFA Club World Cup semi finals, against either Cruz Azul or Western Sydney Wanderers, right next Tuesday, December 16. You can watch Juventus live stream, Real Madrid vs Cruz Azul or Western Sydney Wanderers, Getafe vs Barcelona, Chelsea vs Hull City, Arsenal vs Newcastle, and FC Augsburg vs Bayern Munich, all matches provided from our soccer streams live game pages.